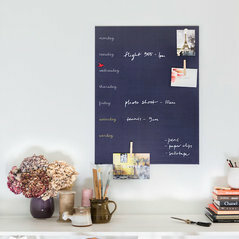 Chart Noticeboards is a home decor design business selling designer noticeboards for the home, office and retail spaces. Co-owned by Sarah Gamble and Jayne Foster Chart designs and manufactures a range of magnetic and perspex noticeboards and magnetic pegboards and accessories. 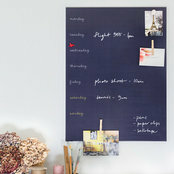 The idea for creating designer noticeboards came when Sarah tried to find a product to help organise her family's busy weekly schedule and after an extensive search ended up designing and making her own noticeboard. Friends started placing orders, Jayne helped put together the website and Chart was born. Many of Chart's designs are offered in a selection of colour choices based on Resene colour palettes and on email request clients can customise their designs. 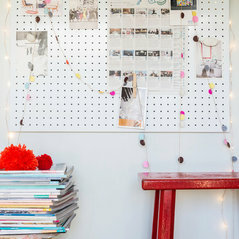 Chart's highly popular pegboards and custom accessories also come in a range of colours. The boards are available for purchase online and are shipped throughout Australia and New Zealand. Typical Job Costs:INR 99 - INR 399Our designer boards come in a range of sizes and prices from 99.00 NZD. We also carry a range of noticeboard and pegboard accessories under 100.00 NZD.